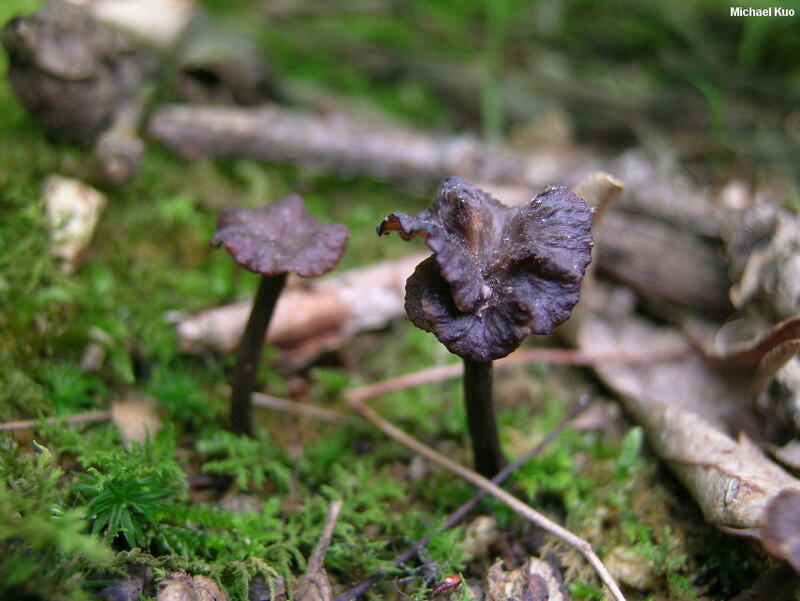 Craterellus calyculus is the tiniest of eastern North America's so-called "black trumpets." 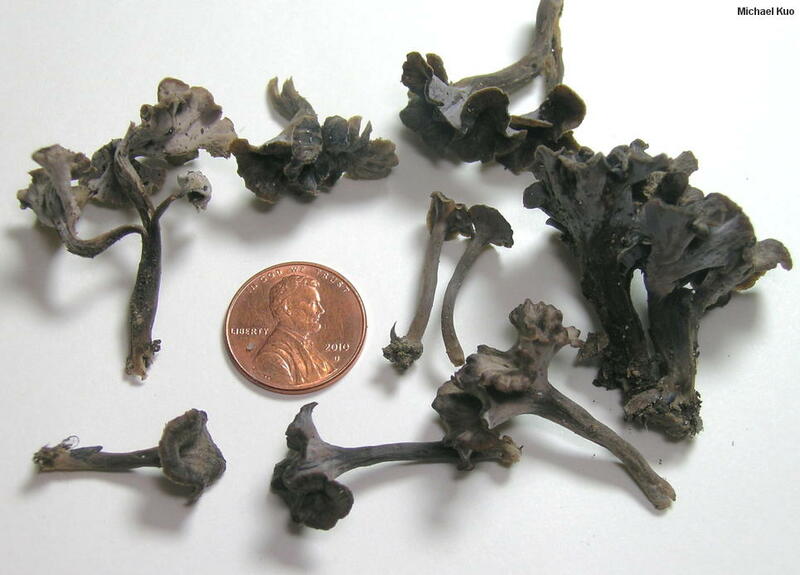 With a cap that is usually well under 3 cm across and a stem maxing out at 3 mm thick, it is only a fraction of the size of Craterellus fallax and Craterellus foetidus. 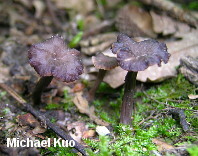 Craterellus calyculus can also be recognized by its stature (it is not truly vase-shaped like the other black trumpets), its clearly defined stem, and its fairly smooth undersurface. Descriptions of Craterellus calyculus vary substantially; Smith and collaborators (1981), for example, say the species has spores 7-9 x 4.5-5 µ, while Bigelow (1978) says they are 10-11.5 x 7-8 µ. Petersen (1969) found the spores of the type collection to measure 9.7-12.1 x 6.8-9.1 µ. 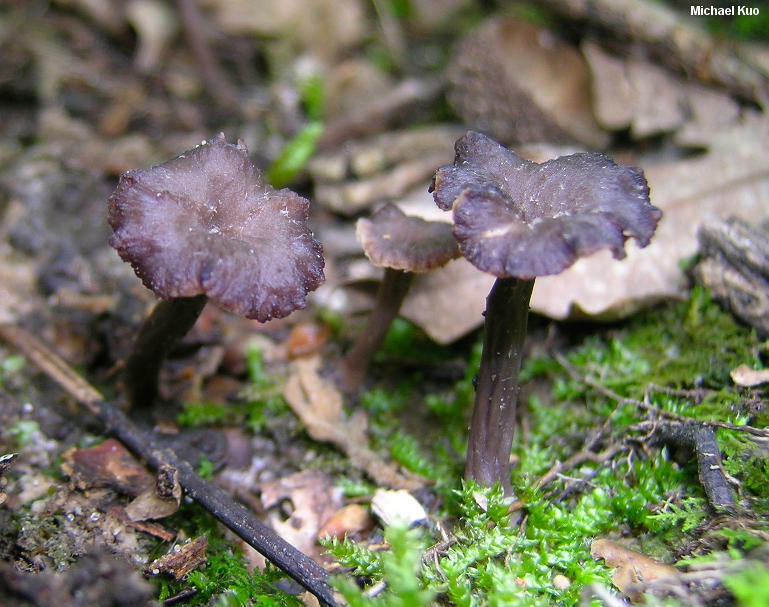 According to Bigelow, the similar Craterellus subundulatus can only be reliably separated from Craterellus calyculus on the basis of its smaller (5.5-8 x 4-5.5 µ) spores. Smith's Craterellus calyculus may therefore be Craterellus subundulatus--or it may be the case that the two species should be synonymized. In his monograph of the Cantharellaceae world-wide, Corner (1966) does just that, placing them both under Pseudocraterellus sinuosus, which he says is "a very variable species, both in the size of the fruit-body and the spores, for which reason I can see no means of distinguishing P. calyculus or P. subundulatus." Petersen (1975), however, argues that argues that the spores of Craterellus calyculus are "significantly larger," and keeps the species separate. Which brings us to the "Pseudocraterellus" question. Some mycologists have placed this and similar species in a separate genus, Pseudocraterellus, based on hyphal structure. But more recent molecular results from Dahlman and collaborators (2000) clearly place Pseudocraterellus sinuosus within the genus Craterellus. Ecology: Mycorrhizal with oaks, and perhaps with other hardwoods; growing scattered, gregariously, or in loose clusters; usually found in mossy areas; spring and summer; probably widely distributed east of the Rocky Mountains. The illustrated and described collections are from Illinois. Cap: 8-30 mm across; flat or with a shallow central depression; typically without a perforated center, but occasionally becoming perforated over the center; dry; matted-hairy to finely scaly; dark gray to black, fading to gray; the margin uplifted and often becoming wavy, scalloped, or irregular. Undersurface: Running slightly down the stem; bald; smooth, or shallowly wrinkled; gray, with a whitish bloom. Stem: 15-35 mm long; 1-3 mm thick; more or less equal; solid, becoming hollow; bald; dark gray to black; basal mycelium white. Odor and Taste: Odor not distinctive, or slightly fruity; taste not distinctive. 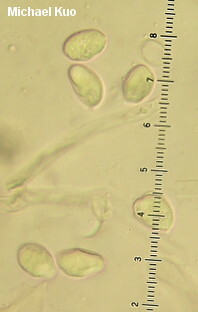 Microscopic Features: Spores 9-12 x 5.5-8 µ; ellipsoid; smooth; with semi-refractive ochraceous contents in KOH. Basidia 4-sterigmate; 65-75 µ long. Elements of upper surface brownish to brown in KOH; septate; smooth; 5-10 µ wide. REFERENCES: (Berkeley & Curtis, 1849) Burt, 1914. (Saccardo, 1888; Corner, 1966; Smith, 1968; Petersen, 1969; Petersen, 1975; Bigelow, 1978; Smith, Smith & Weber, 1981; Thiers, 1985.) Herb. Kuo 06180302, 06200305, 06230906, 07051302.